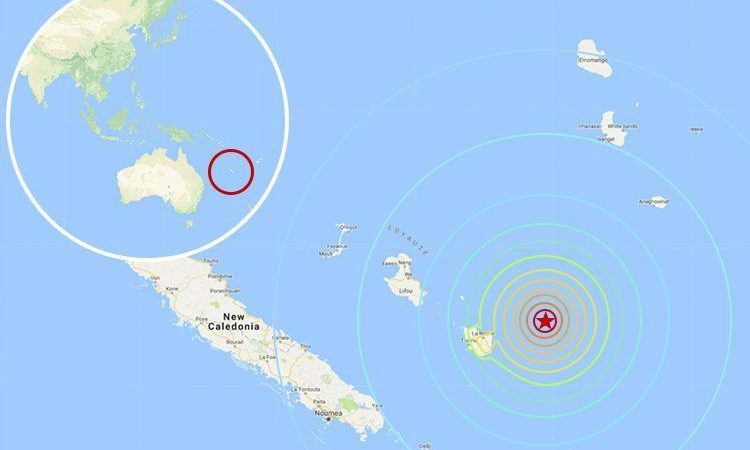 Vanuatu and New Caledonia were bracing for tsunami waves of up to one metre on Monday after an undersea earthquake of magnitude 7.0 struck 82 kms (51 miles) east of the Loyalty Islands in the South Pacific. The quake, initially reported as magnitude 7.3, was the second major tremor in the same area in less than 24 hours and the third in the past month. Monday’s quake struck at 9.43am local time (2243 Sunday GMT) at a shallow depth of 10km (six miles), east of the remote Loyalty Islands, the United States Geological Survey said. The US Pacific tsunami warning centre said hazardous tsunami waves of 0.3m to one metre were possible along the coastlines of New Caledonia and nearby Vanuatu in the South Pacific. “Government agencies responsible for threatened coastal areas should take action to inform and instruct any coastal populations populations at risk,” the PTWC said in an alert. Vanuatu’s national disaster management office advised people in southern provinces to evacuate coastal areas for higher ground. New Caledonia’s civil security agency said it was still compiling data, and was not planning to evacuate immediately. “We are a little bit scared, we have had an earthquake last night and today it was quite a big one,” said Wayan Rigault, communications manager at Hotel Nengone Village on the island of Mare, which is the closest landmass to the epicentre. Authorities in Australia and New Zealand said there were no tsunami threats to either of those countries.